I’d often wondered whether there really were any differences among the major AA and AAA alkaline battery brands. Sure, Duracell and Energizer both put out numerous ads claiming to have the best battery life, but I figured that was nothing but boisterous marketing. Surely they must be about the same, right? How wrong I was. You can indeed buy a bad brand-name battery. But I’m getting ahead of myself. To answer the question, I decided to measure the actual usable capacity of AA and AAA alkaline batteries from the major brands under conditions simulating light to heavy loads. I wanted a rigorous, repeatable experimental setup, so I used an Itech 8511A+ programmable DC load on my lab bench to drain the batteries under precisely controlled constant-current conditions and recorded the data points on a PC. Each battery was in a properly sized battery holder, and it was connected to the load with a 4-wire setup. Lest anybody claim I’m in the pocket of Big Battery, I bought all of the batteries I tested at retail, and I took no money from anybody. I will admit that the testing scope kind of snowballed out of control and as a result took a lot longer than expected. 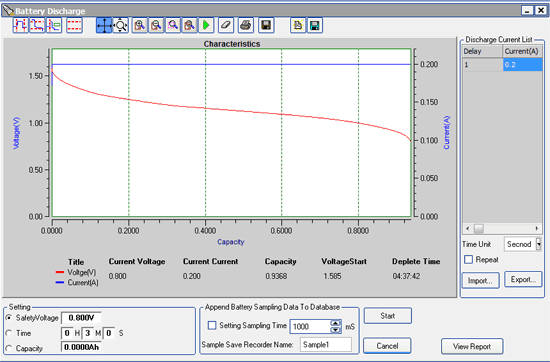 I could test only one battery at a time, and when light loads met high capacities, it would take several days to complete a single test (of three) for each battery. Fortunately, it turned out that a lot of batteries were crap, so some tests went unexpectedly quickly. 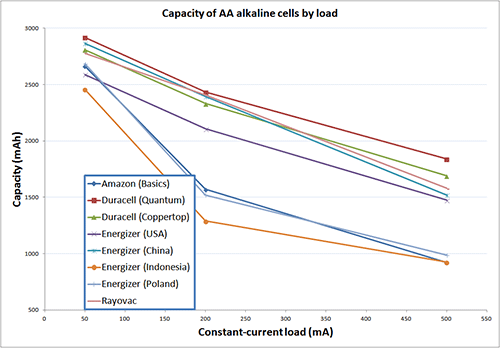 Energizer, Duracell, Amazon Basics, and Rayovac were the contenders in the alkaline AA ring, with two Duracell sub-brands represented (Copper Top and Quantum) and four Energizer manufacturing locations in the field (Poland, Indonesia, China, and the USA). Round one? A light load, specifically 50 mA. While that level is still well above what you’d see in a very light load like a wall clock or a garden watering timer, it turns out that all of the batteries were pretty much the same there: 2700 mAh +/- 10%. Why not test even lighter loads? Time constraints. The capacity in milliamp hours (mAh) is the number of hours of run time multiplied by the load in milliamps. That works the other way, too, so you can find how long a test took by taking the capacity in mAh and dividing by the current in mA, giving hours. A 2700 mAh battery at 50 mA already takes over two days (54 hours) to test; testing at 10 mA would take about a week and a half. I didn’t have that kind of time or patience, but somebody else did. As the load was stepped up to 200 mA, which you might see with a flashlight on “low”, some differences among the brands emerged! With a 200 mA load, there was more than a factor of two difference between the worst performer (the Energizer Max AA manufactured in Indonesia) and the best performer (a Duracell Quantum). 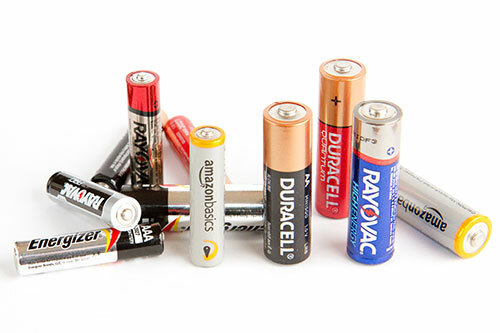 The Coppertop Duracell sub-brand was near the top, as was the Rayovac, while the Amazon Basics options had middling performance not far ahead of the worst Energizers. Oddly, the performance of the Energizer batteries was very strongly tied to the manufacturing location. The Energizer batteries made in China performed pretty well — right up there with the Duracells and Rayovac. However, the Energizer batteries made in Indonesia and Poland were terrible. The Energizers made in the USA were pretty good but not great, sitting somewhat back from their Chinese brethren. Not all Energizer AA alkaline batteries are made in the same place, and the quality can differ according to the manufacturing location. 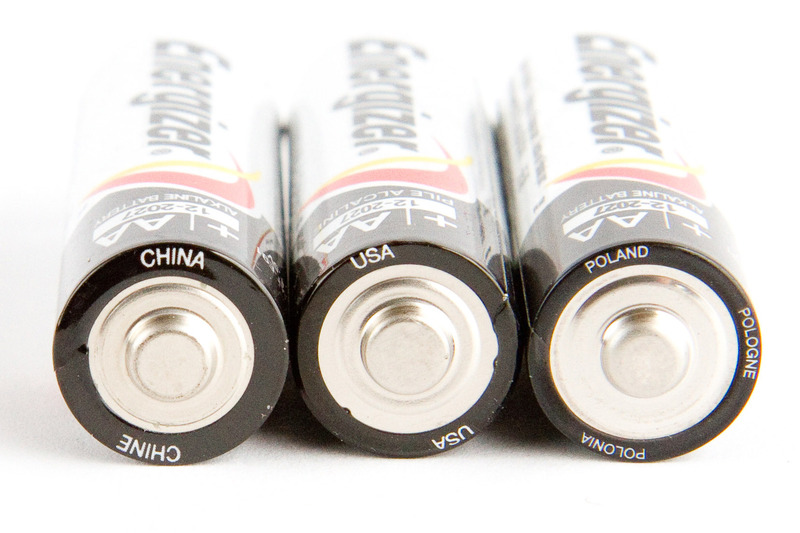 The place of origin can be found on the positive side of the battery. The same trends held at the 500 mA level, similar to a reasonably bright LED flashlight. The Amazon cells and the Indonesian and Polish Energizer cells occupied the rear again, with only about half the capacity of the Duracells and Rayovac, which were again in the lead. The American and Chinese Energizers rounded out the front group, about 15% off of the best performer, the Duracell Quantum. The Energizer bunny sure has a good side and a bad side, at least based on the AA tests. Energizer fanboys aren’t going to be happy. On the other hand, Duracell partisans are probably feeling pretty smug. The Copper Top (and Quantum) cells were consistently great in the AA tests. Other than the Energizer results, the big surprise for me was how poorly the Amazon Basics cells fared. Since those are also made in Indonesia, and since certain tell-tales on them look very similar to the Indonesian Energizers (but not the other Energizers), I can’t help but wonder if perhaps both Amazon and Energizer sourced some AA batteries from the same OEM in Indonesia. Just speculation, nothing more. On to the smaller batteries. Would the same relative brand results hold? Spoiler: no. I did a limited test of cheap alkaline AAA batteries last year, but this time around I looked at the brand name offerings. Alkaline AAAs from Duracell (Coppertop and Quantum), Energizer, Rayovac (Fusion and normal), and Amazon Basics were in the running. All of the Energizer AAAs I found were made in the USA, unlike with the AAs. At the 50 mA level, which would provide data that would be useful for selecting the cells for your TV remote, even the worst performer was only 15% back from the best performer. Thus, for light-load applications, just get whichever of them is cheapest and don’t worry too much about it. Things got more interesting at the higher drain currents, which would be relevant for things like LED headlamps, flashlights, or radios. The best and worst options at 200 mA were both made by Rayovac: the normal alkaline Rayovac was the worst, but the Rayovac Fusion was the best. Close behind the Rayovac Fusion was the Amazon Basics AAA. Energizer and Duracell were mid-pack and about even with each other. At the highest drain level, 500 mA, the Rayovac Fusion option blew away the competition, while the normal alkaline Rayovac was dead last. I mean, dead first. I mean… it had by far the lowest usable capacity, only about 50% of that of the Fusion sub-brand. The Amazon Basics option was pretty good, and the Duracell and Energizer entrants were both closer to last place than to the front-runner. In other words, the AAA results were entirely different than the AA results. Just because a manufacturer can make a good AA battery doesn’t mean they can make a good AAA battery, and vice-versa. Or, in the case of Rayovac, they clearly know know to make a good AAA battery but choose not to apply that knowledge uniformly across their product lines. Duracell was consistently decent, though not always the best. Energizer was surprisingly inconsistent based on the manufacturing location used for a particular lot. Rayovac was great for AAs, great for some AAAs, and terrible for some AAAs. Amazon’s “Basics” house brand was roughly the opposite: great for AAAs but pretty bad for AAs. I had been looking at component catalogs and distributor inventories for so long that my eyes were throbbing. I was searching for a particular circuit board connector, but it seemed there were none to be had. Not here, not there, not anywhere in the world. They no longer existed. I realized I was down to a single option: a custom manufacturing order. I had never done that, and the prospect scared me. Why bother? To play Duck Hunt, obviously. Spoiler: the custom connectors actually arrived! Bliss! The connector was — deep breath — a 72-pin straddle-mount female card-edge type, somewhat similar the expansion-board connectors on a computer motherboard. That alone would be, if not common, at least not too obscure, but there was a catch: I needed a 2.50 mm pin pitch, not the standard 2.54 mm pin pitch. For reasons lost to history, Nintendo used that 2.50 mm pin pitch on their Nintendo Entertainment System (NES) game cartridges back in the 1980s. 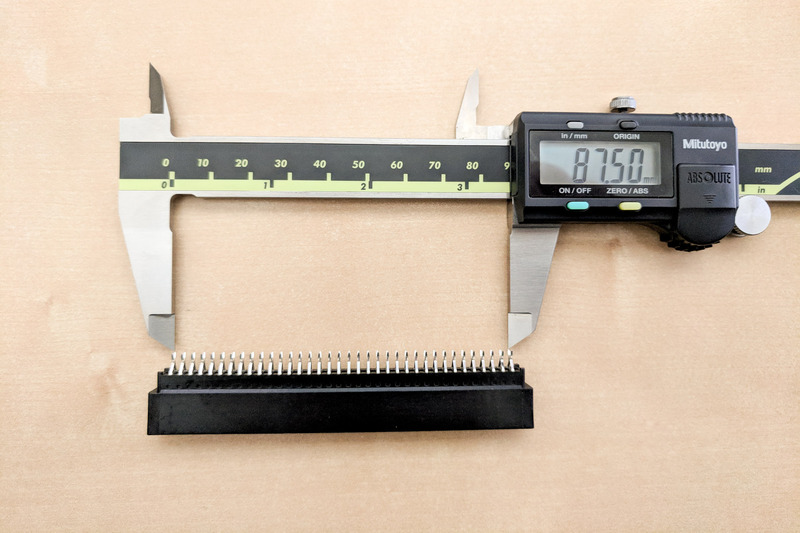 If there were just a few pins on a cartridge, the 40-micron difference between 2.50 and 2.54 mm wouldn’t really matter, but with so many pins, two rows of 36, the summed error is enough to cause shorts near the card ends. The motivation was a project of passion: getting the NES game Duck Hunt to work on an LCD TV. The game usually requires an old CRT (tube) TV, but I’d figured out how to modify it and the Zapper light gun to make it work on with an LCD. 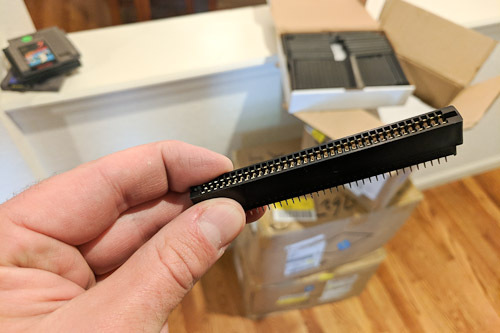 I needed the 72-pin connector to build a pass-through board that would apply certain patches to the game on the fly to let it tolerate things like extra video input lag. It would be conceptually similar to a Game Genie. 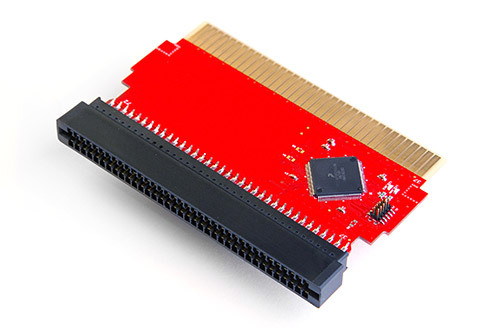 In fact, my early prototypes of the pass-through patch board used a 72-pin connector salvaged from an old Game Genie, but that approach was a huge pain and required sourcing and destroying old Game Genies. The connector as it will be used: on a pass-through board to patch Duck Hunt so it will work on modern TVs. I began my search with the US-based suppliers, but when I started getting quotes above $7 per connector in low-thousands quantities — and that was just for standard 2.54 mm pin pitch — I realized that was untenable. Nobody would even return my calls when I attempted to clarify that I was looking for something non-standard, like 2.50 mm pitch. While contemplating what to do, I happened upon a story at written by a guy in a similar situation a few years earlier. He had needed some DB-19 connectors, which were similarly no longer manufactured. He went to China, the “workshop of the world”, and so, I would go there to. Alibaba had always fascinated me. It was a land of broken English but endless possibilities. Seemingly anything I could think of could be found there, either by the actual OEM or a factory that didn’t mind making a knock-off. The fact I’d never ordered anything off of Alibaba made it a little mysterious, but I was otherwise stuck, so I figured, “Eh, whatever,” entered “card edge connectors” in the box, and clicked “Search”. Approximately 1,000 companies held themselves out as being potential providers. Hmm. Over 1000 possible card-edge connector suppliers listed. Too many options! The trick, I learned, was weeding out the actual manufacturers from the mere distributors. In theory, that should be easy, since Alibaba allows companies to be categorized as “manufacturers” or as “traders”, but in practice, many traders also claimed to do a little manufacturing on the side, and vice-versa. In order to tell them apart, I had to look at their product lines. If the company sold a wide variety of products across several categories, but claimed to have only relatively limited manufacturing floor space (also listed on Alibaba), that was a red flag. It was similarly a red flag if they used the same stock photos as everybody else, even if those photos were emblazoned with bespoke watermarks or graphical overlays. After identifying six companies that appeared to actually make card-edge connectors, albeit with specifications different than I needed, I contacted them through Alibaba’s messaging system. I described what I was looking for and asked them whether they could provide such pieces and on what terms. I also sent a technical drawing showing the 72-pin 2.50 mm pitch female straddle-mount cart-edge connector. I didn’t have one handy, so I grabbed a drawing for a 2.54 mm pitch connector that was otherwise appropriate, tweaked a bunch of things in Photoshop to match what I needed, and attached that to my inquiries. Of the six companies, only three responded. The first sent a polite note that they could not help. The second sent what has to be one of the gutsiest replies I’ve yet encountered in business. “Yes!” they said, they could sell me those connectors. In fact, they had them in stock, and they could ship them immediately for US$1.10 each. That seemed very suspicious. I asked them to send me a technical drawing of the part they had in stock so that I could check that it would meet my needs. What did they send me? Why, a cropped version of the drawing I had sent to them! I couldn’t believe it. It was definitely the crappy Photoshopped drawing I had put together, except with the edges cropped in. I was so surprised that I wasn’t sure whether to laugh or be angry. The third company, one based in Guangzhou, was much more professional. After working through some clarification — yes, I was sure I wanted 2.50 mm pitch, not 2.54 mm pitch — they sent me a technical drawing of a connector they could produce. More importantly, it wasn’t the drawing I had sent in the first place. It looked perfect. And the price? An order of magnitude cheaper than the non-custom connector the stateside manufacturer was trying to sell me. The only catch was that I would need to order 2000 of them at a minimum. 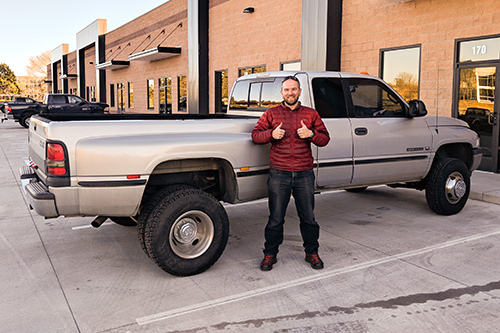 My fears rapidly shifted towards how to pay them and how they would get the components to me. How did international payments work? How did shipping work? Would I need a broker? A fixer? A smuggler? I read horror stories about how payments to mainland China banks were tricky, how shipment was its own beast, replete with a sea of incoterms, and so on. Would I have to worry about customs? How would I even find out? Fortunately, the connector manufacturer was large enough to have well-oiled solutions for such situations. I paid them via credit card using PayPal, the destination apparently being an account at a bank in Hong Kong. Then, for getting the parts back to me, they gave me a variety of EXW options, including DHL and FedEx. I chose FedEx IE, which balanced cost with speed. The PayPal payment complete, I crossed my fingers and waited. A few weeks later, but five business days ahead of schedule, I received a FedEx tracking number from the company. Woo! I was excited! Surely my connectors would arrive in short order! Thus began a 10-day slog in which I learned that FedEx IE (international economy) is a lot different than FedEx IP (international priority). An airplane was involved, but it might as well have been a slow boat. I watched as my package lingered for days in Hong Kong. The FedEx tracking page claimed that the “shipping exception” was due to “scheduling due to shipper request”. It turns out that doesn’t mean my vendor requested something shipping-related, but rather, that FedEx itself was deprioritizing the package. Of course, none of that was obvious when I made the initial shipment, and getting more details about the shipping schedule beyond “It should arrive within a few weeks” was nigh-on impossible. After the better part of a week, the packages started to move, albeit slowly and on an indirect route. Taipei. Anchorage. Memphis. Would it ever arrive? But arrive the packages eventually did, on a sunny morning a month to the day after I’d first contacted the Chinese manufacturer. The doorbell rang, my dog Sophie barked, and there I found my 87 lbs. of connectors, all 2000 of them of them, boxed and covered in Hanzi characters. “Enjoy your… whatever they are!” the FedEx guy said. I was giddy with anticipation as I cut through the tape on the topmost box. Inside, I found a stack of smaller white boxes, each labeled “72-pin female straddle 2.50mm” — a good sign!. I lifted the lid. There they were! My connectors, packed neatly in rows and layers. A quick check with calipers confirmed they were the correct size. Hooray! Incredibly, they met specs: 36 pins (per row) at 2.50 mm spacing is 87.5 mm center to center from start to end. I soldered one to the patch-board PCB I’d designed and plugged in a real NES cartridge. Worked great! I zapped some ducks on my LCD TV to celebrate. UPDATE June 28th, 2018: More to the story coming when I get around to writing it! In the meantime, I’ll jump ahead to the part where I made this available so you too can play Duck Hunt on your LCD TV. 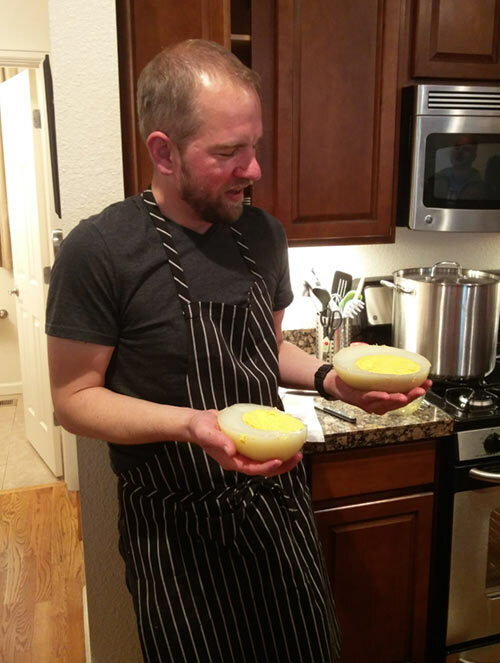 Five years ago, my efforts to hard boil an ostrich egg ended in undercooked disappointment. This year, I set out to correct that failure — and then some. 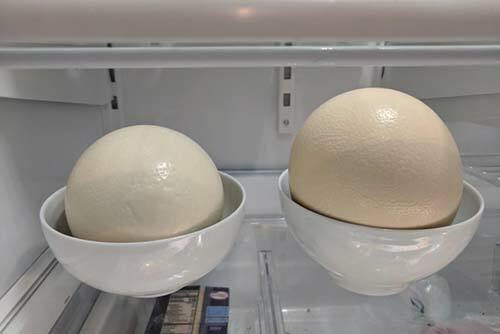 An ostrich egg is similar to a common chicken egg in many ways: there is a yolk; there is a white; and there is a shell composed mostly of calcium carbonate. The main difference is that it’s about two dozen times bigger. That size difference makes for appealing pageantry among the foodie set, of which I am an occasional interloper. In 2013, I acquired a fresh ostrich egg over the internet, gathered a handful of friends one evening, and tried to hard boil the egg. Expectations were high as I sliced through the shell with a Dremel, but then: disaster. Beyond a thin outer layer of cooked egg white, we found little more than a sad, gloopy mess. The yolk wasn’t the least bit set. Lesson learned: an hour on the boil isn’t even close to enough time to hard boil an ostrich egg. This year, I decided to try again. I resolved to taste naught but sweet success. Or savory success. Or whatever ostrich egg tastes like. I ordered two fresh unfertilized ostrich eggs from Floeck’s in New Mexico. A couple days later, they arrived wrapped in layers of bubble wrap and really cute baby diapers. Even though they didn’t really require refrigeration — we refrigerate chicken eggs in America primarily because their natural protective coatings are usually stripped during processing — I stuck them in the fridge. Why two eggs? It’s not like one would have been insufficient, as they each had a mass of about 1.5 kg. Instead, I got two so that this time I’d have a “practice” egg. If I screwed that one up, perhaps by once again under-cooking it, I’d be able to recover with the second one. The practice egg went into a pot of boiling water the night before I was going to have some friends over for brunch. After two hours on the boil, I removed the egg, gave it a spin, stopped the spin, and then let go again: the egg remained stationary. Had the egg resumed spinning, that would have indicated that liquid was still present inside, and so I would have cooked it some more. Instead, I plunged it into a cold ice bath while I got my hacksaw from the garage. 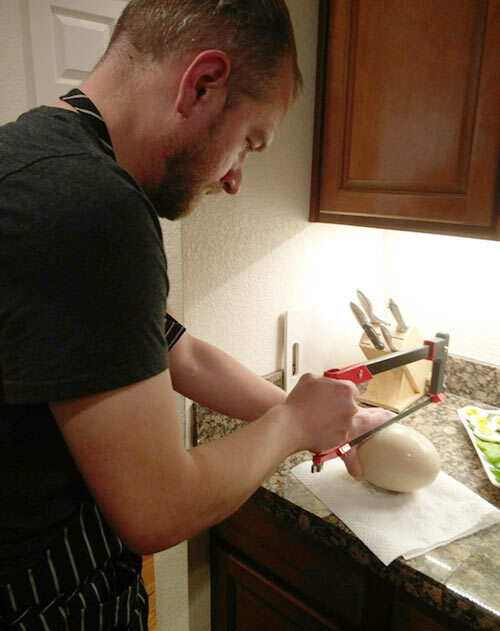 In a process that was repeated the next morning with the second egg, I sawed slowly around the circumference and chased the cut with a sharp knife to pierce the tough membrane that lined the interior of the shell. Then, slowly, I pulled off each end of the shell. A translucent white egg, gelatinous in appearance but firm in texture, was revealed. Another cut was made, this one orthogonal to the saw line, splitting the egg into the two halves that are traditional for deviling. From there, the deviling process was about the same as one would do if one were deviling chicken eggs: scoop out the yolk, mash in some mayo, brown mustard, garlic powder, cayenne pepper (dried), and Cholula (partially because of its acidity); put the mix into a piping bag; pipe back into the now-empty whites; and garnish with chives and paprika. For extra effect, I plated the eggs on beds of spinach leaves, which had the added benefit of keeping the eggs from sliding around. My brunch guests and I agreed: ostrich egg tastes like chicken egg, perhaps ever so slightly “lighter”. And a deviled one? Heavenly. UPDATE November 19, 2017: Since this post was made on October 3rd, 2017, I’ve done a number of additional tests on many more batteries. 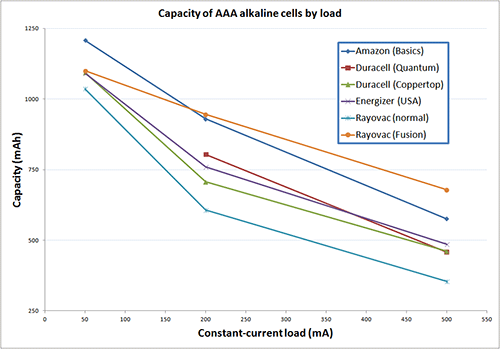 I’ll do a follow-up post eventually, but here are some new key results: first, the performance of a manufacturer’s AAA alkaline batteries is in no way predictive of the performance of a manufacturer’s AA alkaline batteries. 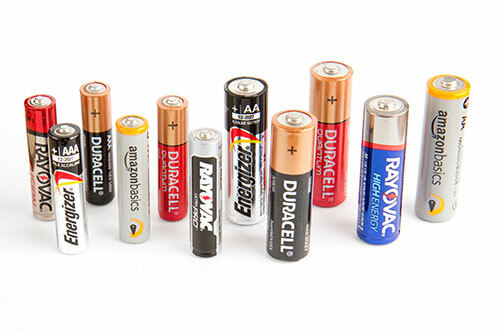 As an example of that, Rayovac makes some of the lowest-capacity AAA alkaline batteries but some of the highest-capacity AA alkaline batteries. Second, there can be a surprising amount of variation within a manufacturer. Energizer is particularly poor in that respect, with their AA batteries manufactured in the USA and China significantly outperforming their AA batteries manufacturer in Indonesia and Poland. For many years, I’ve been a loyal customer of Rayovac alkaline batteries. I thought they were just as good as Duracell and Energizer, they had strong reviews on Amazon, and they were cheap. However, that worldview came to a shattered end when I read a review on Amazon for some Amazon Basics AAA alkaline batteries. In that review, the reviewer claimed to have measured the actual charge available in various brands of AAA alkalines, and they claimed that the Rayovac AAAs had performed especially poorly. Say it ain’t so! I decided to run my own tests, either to restore the honor of the Rayovac brand or to join the bandwagon throwing tomatoes at it. For good measure, I decided to also test a couple of other brands of cheap AAA alkalines: the aforementioned Amazon Basics AAA alkaline, and the Harbor Freight AAA alkaline. To do the testing, I used an Itech IT8511A+ programmable DC load along with some desktop software to control the DC load and record the results. One battery at a time would be placed in a single-AAA holder. The leads from the holder were split, with one pair of branches going to the load terminals on the front of the Itech and the other pair going to the “remote sense” terminals on the back of the Itech. By using separate lines for the load and for voltage sensing, I would avoid problems with voltage drop on the leads due to the current and the non-zero resistance of the wire. This “4-wire” arrangement is also used for measuring precision resistances for the same reason. 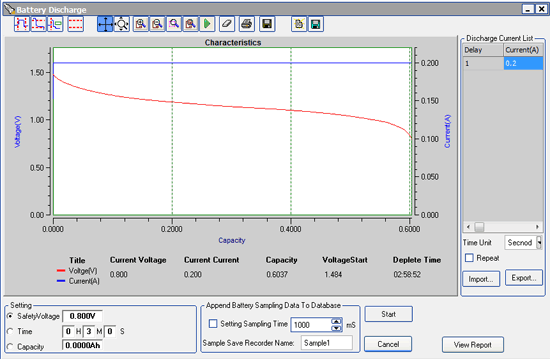 Battery capacity is load-dependent, with more capacity for lighter loads, so I used three different constant-current discharge rates for each brand of battery: 50 mA, 200 mA, and 500 mA. Those would simulate light loads like a remote control, medium loads like a toy, and heavy loads like an LED headlamp. I’d run each test with a fresh battery. The stopping voltage would be 800 mV for the 50 mA and 200 mA tests, and 500 mV for the 500 mA tests. Why those voltages? That’s where the batteries were “dropping off a cliff” — i.e., almost entirely discharged. That’s also around the voltage where modern devices cease to work. Why 500 mV instead of 800 mV for the 500 mA trial? Due to internal resistance, the overall voltage was lower, and I saw that we’d be leaving something on the table if we stopped at 800 mV. The Rayovacs were terrible! No wonder my Black Diamond LED headlamp, which pulls about 550 mA on its brightest setting and about 210 mA on its medium-intensity “side light” setting, always seemed to run through its three AAAs so quickly. I mean, look at those numbers: the Rayovacs at 200 mA had about the same capacity as the Amazons at 500 mA. The Rayovacs managed only 60% of the capacity of the Amazons at 500 mA. Ouch. 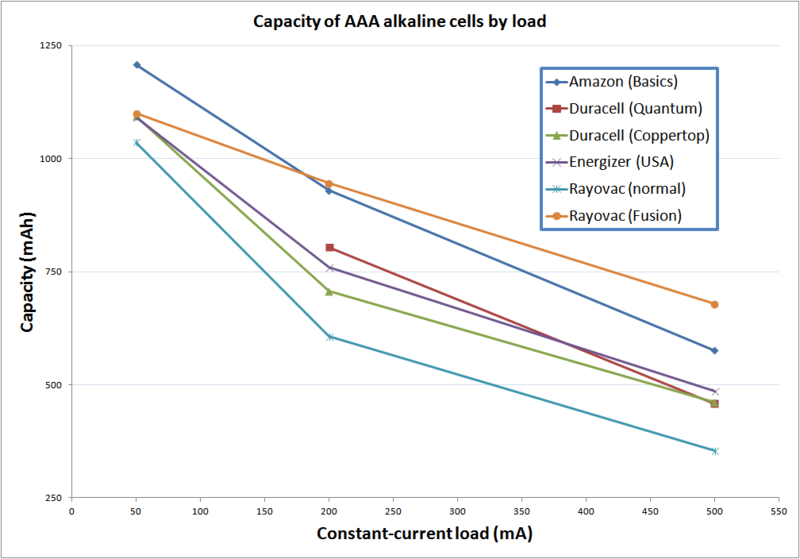 Admittedly, the problem was less pronounced at the lowest current drain in the test, but the Amazon batteries still had about 15% more capacity than the Rayovacs. All of the batteries were fresh. The Rayovac batteries and Amazon batteries were obtained from Amazon, and the Harbor Freight batteries were obtained in person from my local Harbor Freight. Don’t be fooled by the lower starting voltage of the Rayovac batteries in the 200 mA test screenshots above (1.48 V versus about 1.6 V for the other two). I did the test several times to make sure. Notably, they always started up above 1.6 V under no or light loads, so the cells were fresh, and since the same battery holder was used for all of the brands of batteries in all of the tests, it wasn’t an artifact of resistance in the holder. Roughly 10% behind the Amazon batteries on every test — but way ahead of the Rayovacs — were the Harbor Freight batteries. Note that these are the Harbor Freight alkalines, not the Harbor Freight “heavy duty” batteries that they often give away in promotions. Still, they’re usually on “sale” for about $0.21 per battery, so they’re still pretty cheap. If you can get the Amazon batteries for less than about $0.23 per battery, that might be a better value, but I’ve found they’re usually slightly more than that. Rayovac: it’s been great, but we need to break up. I’m an Amazon or Harbor Freight battery guy now.